This is a fabulous species, Pedro, and your image shows all those beautiful patterns, details and colours on the open wings extremely effectively. Wish we knew its ID! A beautifully marked butterfly and thanks to Nigel, we now know it's name. Your Chlosyne theona, also called Theona Checkerspot is shown in sharp focus, allowing us to view it's uniquely checkered and colorful wings in good detail. Looks like this particular specimen got little tattered and torn, but still a pretty specimen. Beautiful butterfly and great macro Pedro. Beautiful butterfly and many thanks to Nigel for the ID. Nice color and sharpness. Magnificent capture of a very nice colorful specie of butterfly. The details, colors and focus are on the top. Nice macro of this injured butterfly. Good composition,amazing colors and sharpness details. 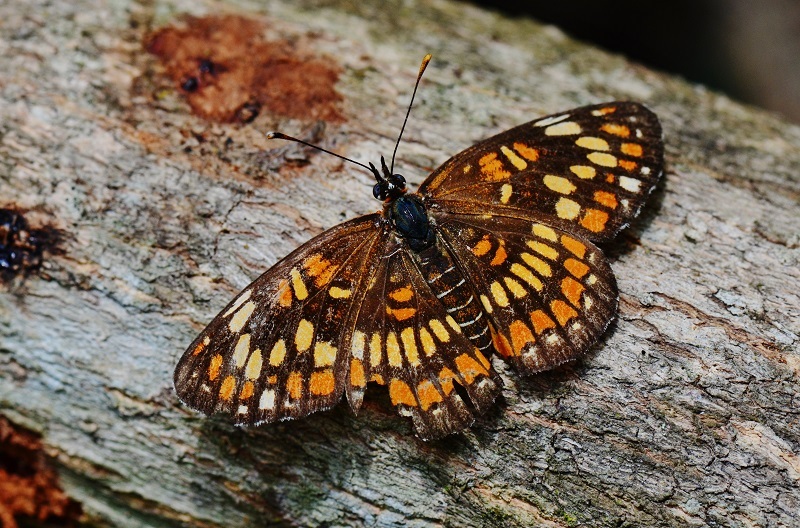 Very beautiful photo of this Theona Checkerspot, in English. Excellent sharpness, details and a fine composition.